You've most likely seen the commercials and wondered what's up, as there's not much to be found online. Is is really like Netflix for black folks? Being the blaxploitation movie junkie that I am, I decided to give the free trial a shot. Will this rare movie ever make it Bounce TV's new streaming service? So the sign-up process is pretty cut and dry. I load this onto my Chromebook mainly because the memory won't have to fight with Adobe CC on my laptop for space. Plus the device is less than a year old and because it's so finicky about what a person can download, there's room for a streaming service. At four dollars a month, it's half the price of Hulu (with commercials) but in viewing the inventory, it takes a moment to see if it's worth THAT much. Brown Sugar has the standards (the Superfly and Shaft trilogies), along with some flicks that are seeing new life like ABAR, the Black Superman and my favorites Willie Dynamite and Hit Man with Bernie Casey. 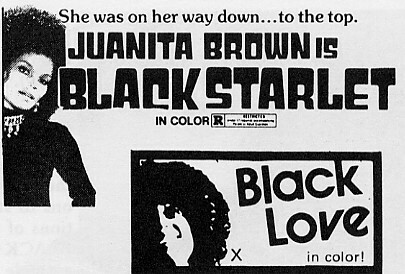 Upon second glance, I notice a few that aren't familiar but I remember that movies like Black Starlet have alternate titles (Black Gauntlet). This was the case in one of my favorites that I don't own, Black Sister's Revenge, also titled 'Emma Mae' in the Brown Sugar catalog. So what is my conclusion? Basically, if you like to collect (VHS tapes included), this might be a waste of money. Or, if you have a great relationship (as in you don't mind the interruptions) with YouTube, you can take a chance on movies that may be there one day and gone the following week. If you're Amazon friendly, I've always had good service with Gateway Cosmetics and other vendors that specialize in Black movie sales. Brown Sugar streaming is great for the binge watcher with no space for a bunch of discs or watches in the peak hours. As far as the experience itself goes....it was Saturday and its me with the Chromebook. I look up a movie from 1968 with Max Julien that I think I saw but not 100% sure. It takes a moment to load, so I go get snacks (3-5 mins). Upon return, I recognize the opening theme but sit for the first 5 minutes. Not even into opening scene, there's buffering. Okay, things take time and this movie is as old as I am so let's refresh. Ten minutes in, there's no semblance of a plot and the thing is buffering when I remember that I never saw Charleston Blue. It's not in Brown Sugar's inventory so off to YouTube I go where I get a clean picture with few interruptions and it costs...ZERO. Not condoning bootlegging but if someone knows of a standing store in the L.A. where legit blaxploitation movies are sold, hit me up! Anyway, I do have a suggestion. Why not add the indie flicks that Bounce used to air before they got 90-early 2000s sitcom fever. Seriously, I love Half and Half too but remember the show only aired for three seasons and was definitely affected by the writer's strike near the end. Fine @ss Lamman Rucker made those episodes watchable before its unfortunate demise. Okay, digressing here. I'm really digging indie movie like the ones Aspire shows in the afternoon but my favorite from the early days of Bounce are Drop Squad, The Stick Up Kids, and the one where a pre-nose job Kerri Washington was a window dresser/booster. Sorry (hangs head but snickering). So Bounce, what's up? Can we get something different since you don't quite have 100 movies in your catalog (more like 75 as of Feb 2017)? About a third of those are shown on network and basic cable from time to time, so maybe faster load times. I've had a similar experience with Google so I'm not knocking your efforts, just suggesting a little fine tuning for the long run.